Aaron Rodgers and the Packers seemed to have the NFC Championship game in hand before it all fell apart in the final minutes, but he says his team has long since closed the book on last season. GREEN BAY — Brett Favre is considered a first-ballot lock for 2016 induction into the Pro Football Hall of Fame. Favre’s quarterbacking successor in Green Bay is blazing a similar trail. Aaron Rodgers enters his 11th NFL season with the Packers vying to win his second career Super Bowl and third Most Valuable Player award. 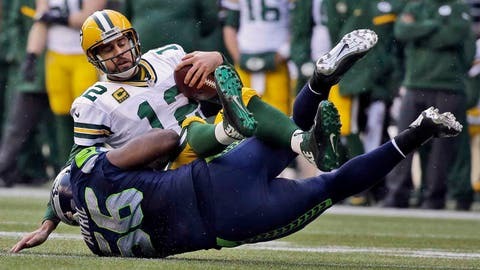 He earned MVP honors last year but failed to play for the Lombardi Trophy after the Packers suffered a fourth-quarter collapse in an NFC Championship game loss to Seattle. Since then, Green Bay has undergone two major changes. Head coach Mike McCarthy has ceded offensive play-calling responsibilities to serve as more of an overseer for all aspects of the team. Star wide receiver Jordy Nelson has landed on injured reserve after suffering a season-ending knee injury during a preseason game against Pittsburgh. FOX Sports senior NFL writer Alex Marvez had the chance to catch up with Rodgers about both those developments, how he spent his offseason, his thoughts on hot-button NFL topics and more during a one-on-one interview at team headquarters. Q: With Mike McCarthy’s role having changed, how different was this preseason from usual? RODGERS: The work has been kind of like it was two years ago. We’ve had some injuries, and unfortunately losing Jordy (Nelson) has made it different. Mike has over the years at times let his coordinators call plays during the games. Not a whole lot has changed. The preparation is a little different, but Mike’s a ball coach. He’ll be around and involved as much as he can. Q: What is the challenge in replacing Jordy? And how will beginning preparation for the season opener against Chicago raise morale around here since players are still down about losing him? RODGERS: It’s tough because he is such a great guy and teammate. His play on the field is exceptional. He does things that you just can’t teach out there. You can’t replace him with one guy. It’s just not possible. You just have to have everyone else lift their level of play and try and make up for the loss, if that’s possible. But you don’t get better losing a guy like Jordy Nelson. You just try to get back to where you were when you had him. Q: You spoke publicly about preseason games being "meaningless" after Jordy was hurt against Pittsburgh. How would you change the preseason? RODGERS: There are a lot of things that need to get looked at. The number of games is obviously one of them. I don’t think we need four. Two teams have to play five. That’s tough on everybody. Obviously, it’s important for young players to show what they can do. But a lot of times there’s agreements between coaches to maybe not pressure the (quarterback) during a game or do a certain type of coverage, or there are agreements within organizations in game plans that you’re not going to show different plays. How much of a real game are you really simulating? I’d say a lot less than people think. You’re out there putting your body on the line. Some of these young guys are getting paid $150, $180 a day and have (salary) splits in their contract should they get injured. There are not a lot of guarantees for some of those guys. You’re putting guys at risk out there, and the No. 1 players sometimes as well as we’ve seen across the league. It’s not just with Jordy but a lot of different teams have lost key starters. You hate to see that ever but especially in a game that doesn’t count in the win or loss column. 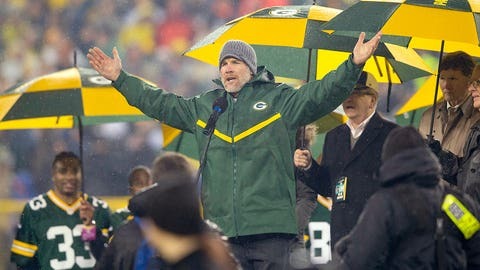 Q: There is some thought that the Packers will be playing in the 2016 Pro Football Hall of Fame game because of Brett Favre’s expected induction. How would you feel about that, and do you think you’d even play in the game? RODGERS: I don’t think I’d play. We hope we don’t get it, but know it’s going to be tough because No. 4 is going to be going in. Q: You told Packers fans and media to R-E-L-A-X after last season’s 1-2 start. Did you truly believe Green Bay would get things turned around or is that type of optimism simply an example of what a leader does trying to get his team back on track? RODGERS: I believed that things would turn around. Maybe not as quickly, as prominently as they did, but I think as a quarterback you have to sometimes get out in front of things and make people believe when the belief level was low. That’s what I was trying to do — let my teammates know I was confident that things were going to turn around. I know I needed to play better personally. But I think when you exude some confidence like that, other guys can pick up on that and pick up the level of their game as well. Q: What goes through your head when you see video cut-ups of last year’s playoff loss to Seattle? RODGERS: It’s disappointing any time you lose your last game of the season, especially in the fashion we lost it in. Those things are frustrating. They probably don’t ever go away if you’re a strong competitor. You know the opportunity you missed out on. But it’s a new season and a new team. They’re not the exact same team. Neither are we. We played them in Week 1 last year and came back around in the same facility that we had lost by 20 in and had the (NFC title) game in our hands. A lot of things change throughout the season. Teams get different. It’s about playing the right way at the right time. Q: How long does it take you to decompress if your season doesn’t end in a Super Bowl victory before you start looking ahead to the next season? RODGERS: For me, what helps is when I can get out of Green Bay. Being here reminds me of playing and the grind and camaraderie. After the last day of the season, that team will never be the same. You put that team to rest — the 2014-15 Packers. It’s a different group that comes back and gets together in April and you kind of start fresh. But once I get out of Green Bay, you start to think about some of the things you have accomplished. You have some pride about the way you played as a group and individually. You start to move on, but it’s tough to watch things like the Super Bowl and be around the festivities knowing you were so close and you let another year kind of slip by. Q: How much more have the Packers practiced two-point conversions this preseason and what impact do you think the new extra-point rules will make in 2015? RODGERS: We’ve done a few in the games. I’m not sure. I like the extra point from the original spot. (The NFL) wanted to spice things up a little bit. I’m not sure how many teams will decide to do a lot of two-point (conversions). Maybe if they’ve got a package they like. Every team is probably working on a number of plays they may like down there, but I think it’s situational stuff. You might not see a whole lot of change because the 33-yard field goal is still above a 90-percent conversion rate. Q: You reported to training camp at 220 pounds, which is a little bit lighter than in the past. What are some of the things you did to vary your offseason training regimen? RODGERS: I’m always looking for different ways to challenge myself. I did a little more boxing this year. That’s the only little workout deal that I’ll divulge at this time. I kind of like to go through the year and see how it goes without any judgment on the way I train and then kind of give some of the explanation later. I started working yoga into my routine in the offseason. I really love that and continue to do that. But I’m always looking for new ways to up my cardio. Boxing was one way that I did it — as long as I was being safe with my wrists. Q: Have you ever done virtual reality training as a quarterback? RODGERS: I’ve tried a couple machines, not extensively. It’s interesting. I think there’s probably a place for that. I can see the idea of the video game deal and virtual reality stuff moving into (football). I don’t know how it’s going to fit as a preparation tool. I know there are different models out there that college campuses are using and trying that are very interesting. Q: Do you have any other ideas about how the NFL can better develop young quarterbacks? RODGERS: I think a lot of it is coaching and situations. I’ve been fortunate to be in a system where I think we’ve got a pretty good idea on how to train quarterbacks. There are other situations where quarterbacks get thrown in with not a lot of talent around them and are expected to do more than what they’re capable of doing right away. You haven’t seen a lot of guys who have been first-year starters in the last 30 years have a lot of success. You can probably list them on one hand with (Dan) Marino, Big Ben (Roethlisberger), (Joe) Flacco and Matt Ryan. Other than that, I don’t know how many guys have jumped right in. Peyton (Manning) had a rough first year, but he also threw a lot of touchdowns and was able to grow from there. I think the model that we’re making for young quarterbacks needs to be reworked a little bit and the way we coach them as well. Q: What inspired you to get involved with endorsing a beef jerky company (Chef’s Cut Real Jerky)? RODGERS: I look for opportunities with people I enjoy working with and I use the product. I don’t get involved with something I’m not going to use. I think the jerky is very tasty. It’s fun to work with those people who are involved with that. I kind of got on them a little bit about putting me out there like that (laughs). I’m just a private investor. I don’t want my name plastered out there with Chef’s Cut although I do really enjoy the product. Q: How happy are you that you continue to raise awareness for the MACC Fund to benefit children’s cancer research? RODGERS: I’m really happy with it. It’s a cause that really means a lot to me, especially for the kids in the program. I’ve been able to help bring exposure to it. We’re looking for new ways to continue to branch out, but I’ve met some incredible people along the way. We’ve done some really fun events and raised some money. The biggest thing is just keeping the issue on people’s minds because it affects all of us one way or the other directly or indirectly. Six degrees of separation connects all of us. This is something I think everyone can really get behind when you’re talking about juvenile cancer that’s pretty deadly. It’s tough on these kids and the families. Q: From a distance, what is the most interesting thing for you watching "Deflategate" unfold? RODGERS: I think the timing, that it’s taken this long to come to a resolution and we’re still sitting here without one with the season a little over a week away. Q: You were on "Jeopardy!" earlier this year and always seem to do something fun and unusual every offseason. How much is left on your bucket list? RODGERS: There’s a lot! I went to Europe for the first time this offseason. I saw Rome. That was incredible. I’m a history buff, so there’s about five or six spots around the world I’d love to see at some point. It’s tough with my schedule and dating an actress (Olivia Munn) and trying to tie our schedules together. But "Jeopardy!" was a blast. I was a kid in a candy store. It was an all-timer for me to get to meet Alex (Trebek) and Johnny Gilbert and the Clue Crew, and then winning was a huge bonus, too. It’s fun stuff like that I look for during my off-time. I definitely need to travel a little more and see some of the ancient wonders of the world.